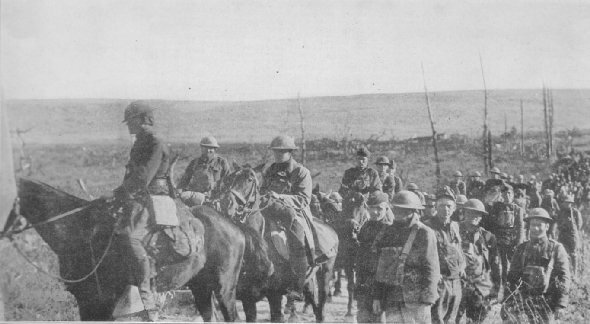 Battery E., 16th Field Artillery, 4th Div., advancing through Malancourt during the Meuse-Argonne drive. The district has been almost entirely denuded of trees as a result of the artillery duels between Allied and German guns. 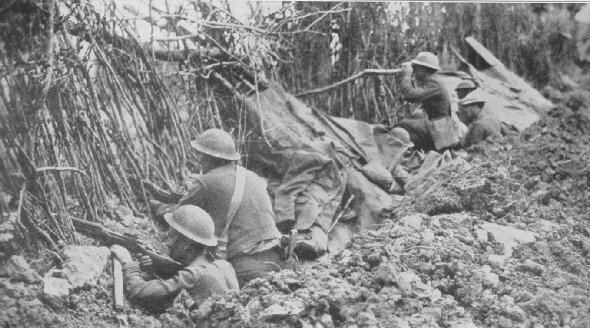 Men of the 132nd Inf., 33rd Div., in front line trench, taking advantage of camouflage left by the Germans. The German line is about 1200 yards from this point. The Meuse separates the lines. Forges, Meuse, France, Oct. 3, 1918.